Brasserie Montmartre’s opening night featured new dishes, new decor, new duck fat fries…and all that jazz. 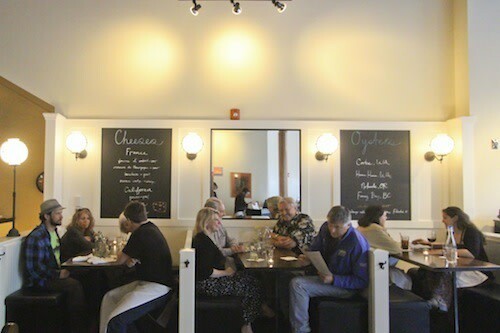 Faced with the challenge of reopening a space filled with the memories of several generations of Portlanders, Brasserie Montmartre’s new co-owners had a few options. 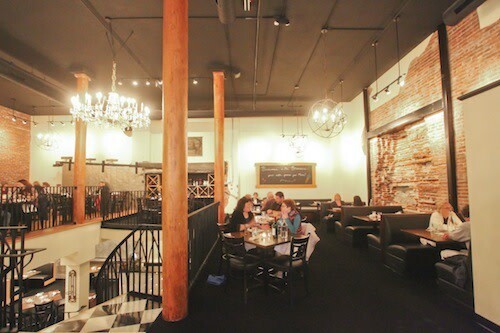 Pascal Chureau and Carl Coffman could have 1) Started from scratch, plastering over the holes in the walls and adding a fresh layer of paint to go with a newly remodeled menu, or 2) Preserved the bistro’s gilded glamor, creating a polished mirror of its former self with a tighter hand on the steering wheel. When Brasserie reopened its doors, they revealed that it is possible to successfully balance the two. On the culinary side, a new small plates bar menu caters to Portland’s beer-drinking cheap eats aficionados (including an impressive $5 burger to go with one of the 12 beers on tap), while a collaborative menu between Chureau and chef Michael Hanaghan preserves the tradition of upscale French classics. Laying bare the history of the space, the interior of the restaurant pays homage to its previous incarnations while courting the next generation of diners. From a large exposed hole in the brick wall (a memento from an attempted break-in to the neighboring jewelry store) to new cafe booths with bistro specials on chalkboard walls, Brasserie nods to the ghosts of the past while stepping into line with modern dining trends. 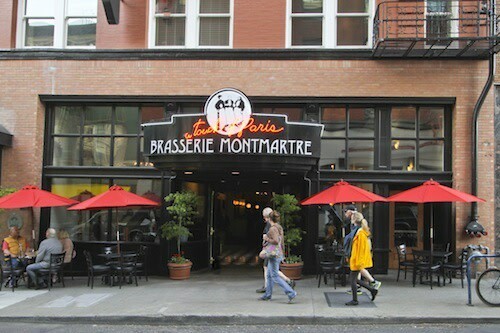 Brasserie Montmartre, located at 626 Southwest Park Avenue, is open Monday to Saturday for lunch (11 to 2), dinner (5 to 10), and late-night happy hour (10 to midnight). Sundays feature brunch (9 to 2), happy hour (2 to 6 pm), and dinner (5 to 10) NOTE: Lunch hours start on May 23rd. A 30-foot bar stretches down the middle of the restaurant, paralleling an additional freestanding wooden-plank bar with plenty of seating for Happy Hour and dinner. 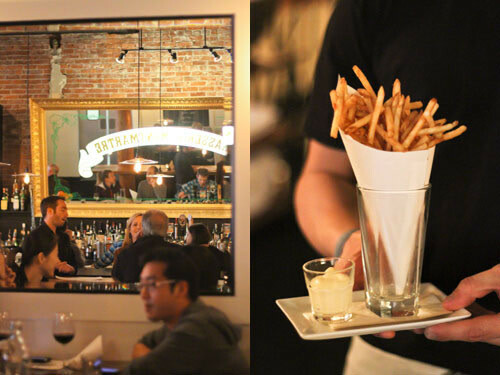 Happy Hour offerings include three variations of pomme frites – duck fat and rosemary, pork belly with tarragon, and black truffle with sel gris ($3-$6). 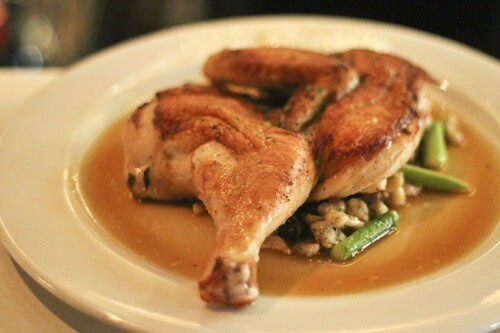 The crispy roasted half chicken with butter poached morels, asparagus, brown butter spaetzle, and tarragon chicken jus was smokey, tender, and filling ($20) and went well with a Henry Miller cocktail (a variation on an Old Fashioned with Old Forester Whiskey and St. Germaine elderberry flower liqueur, $8.50). The old live music stage has been replaced with a round table to give continuity to the dining room. In the background, you can see the large hole where would-be thieves attempted to break through the former hotel’s wall to reach the jewels in the neighboring building. Cozy new booths provide a clean and simple black-and-white aesthetic, a welcome change from the gold walls and velvet curtains of previous Brasserie incarnations. Chalkboard walls show daily cheese and oyster specials. 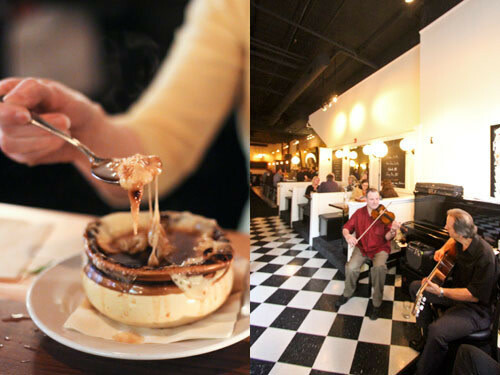 Pascal Chureau’s signature French Onion Soup with beef and veal broth, brioche, and Gruyere makes a reappearance on Brasserie’s new Petits Plats menu (just $4 at Happy Hour). Live music has been moved from the center of the dining room to the entryway, and Portland’s own Gypsy Jazz band, The Djangophiles, will be regular players. 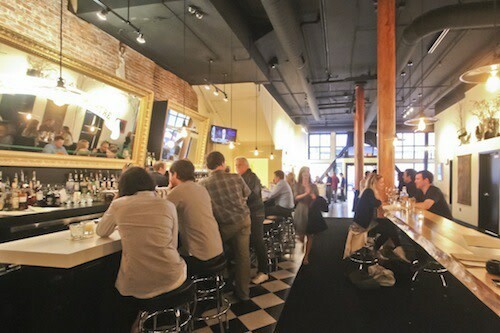 The space has been thoroughly brightened: the 16-foot walls were painted a creamy white, exposed filament bulbs line the bar, and the exterior awnings have been removed to allow in natural light. With the darkening awnings gone, new sidewalk tables bump up the French alleyway feel of the exterior. 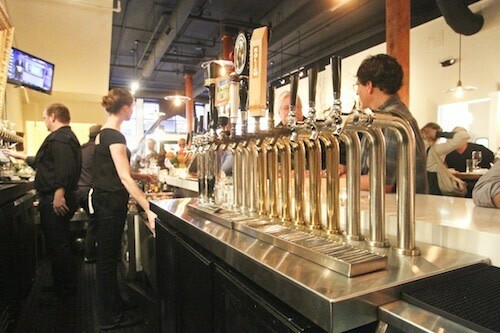 With 12 beers on tap and 12 bottles available (featuring local brews and hard-to-find imports), Brasserie hopes to capture the attention of Portland’s numerous beer lovers. The wine list also caters to value hunters and lunchtime sippers, with 80 quality wines, 40 available by the glass, and table wine available for just $5 a glass. 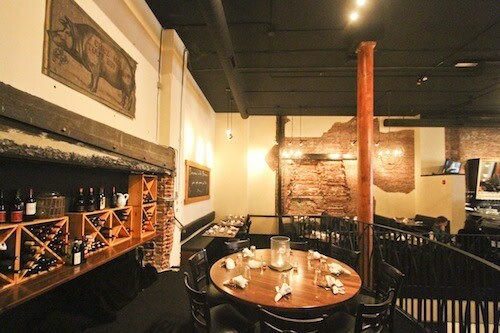 The restaurant’s original two-story steel door (that once allowed entry for large trucks) has been uncovered next to the wine storage, adding a bit of historic industrial chic to the space. It’s amazing how exposing gritty reminders of the distant past can bring an old space into the 21st century.